Two weeks before my wedding I did what many brides have done before me and many will do after: I stopped eating carbohydrates. Now when I say carbs, I really mean grains and starchy foods. Broccoli was okay. Sushi rice? No. Sweet potatoes? Sadly, no. Eliminating breads, starches, and baked goods in addition to cutting out alcohol, processed sugar, and dairy—on the advice of my trainer—quickly whittled my waist, chiseled my arms, and sharpened my jawline. I decided to ghost all the carbs in my life after my final dress fitting at the Saks Fifth Avenue bridal salon. The lace corset top of my Reem Acra gown hugged my chest, causing my back and arms to spill-out. Concerned I wouldn’t feel confident in photos, I made an emergency call to celebrity trainer and author David Kirsch. He not only works with celebrities like Jennifer Lopez and Kate Upton (who often grace his Instagram page), but he’s also the Director and Curator of Fitness & Wellness Programming at the Core Club. After training with him three to four times a week and following his diet advice, my body was completely transformed. It’s been a year since I got married, and my goals today are quite different: Mainly, I don’t want to feel like I’m on a permanent bridal diet. I’m a 5 foot one-and-a-half inches tall, 33-year-old woman with an active Equinox membership who eats a mostly organic, plant-based diet and is educated on macros, Weight Watchers points, and Whole30. Basically, I know what I should be eating and how much of it. I was seeking an eating plan that would not eliminate entire food groups, allow for the occasional Levain cookie, and not make me count anything (calories, points, or steps). I reached out to Kirsch again last month and asked him: “David, how do I live if I am not willing to consume steamed kale and fish for every meal?” For the record, my goal is not about weight loss, but rather achieving an overall slim feeling. I want to debloat while still eating pasta and drinking wine. Do I have to be deprived to feel svelte? What’s the secret? I want to debloat while still eating pasta and drinking wine. Do I have to be deprived to feel svelte? What’s the secret? Kirsch’s answer: it’s as simple as portion control and timing. He put me on a 12-day lifestyle plan: I’d workout five times a week (yoga counts! ), add in strength training, and stop eating carbs after 2:30 p.m.. The time 2:30 p.m. was chosen as a guesstimate rather than an exact science. We wanted to give my body a chance to burn off any of the carbs I consumed earlier in the day to help me debloat overnight. When I consulted with two doctors about Kirsch’s theory, their support was mixed. Dr. Kurt Waples, a functional medicine doctor, doesn’t buy into 2:30 being a magic hour. “Because carbohydrates can spike blood sugar, we want to make sure we aren’t spiking and crashing during the earlier part of the day when we need to focus and drive,” he explains. 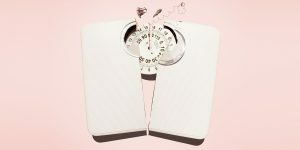 He’s part of the camp that believes carbs can make you groggy—a feeling you don’t want before giving a work presentation or getting on a Peloton bike. On that note, carbohydrates may help us sleep better. “Carbs have been shown to increase serotonin uptake,” Dr. Waples says. “Serotonin is a neurotransmitter that is most optimal to have increased levels of at night as it promotes healthy sleep.” So eating carbs at night could theoretically help you sleep more soundly. We know from studies on lack of sleep that one bad night can lead to eating hundreds of calories more the next day, which would lead to increase cortisol, fat gain, and ultimately an unhealthy state. The same ideas can be applied to bloating. “Most people have their bowel movement in the morning,” Dr. Berkowitz explains. “As they consume food during the day and evening, it’s more of a challenge. The more you’re trying to push in, the more problematic it’s going to be. 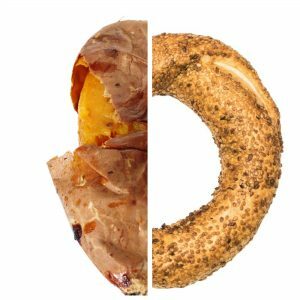 That’s why people tend to be more bloated at night.” That said, everyone is different when it comes to how carbs affect their bodies and sleep, so talk to your doctor before you start setting a no-carb timer for the afternoon. Since I worked out with Kirsch in the mornings at around 8:30 a.m., it made sense that I would consume most of my carbs for breakfast and lunch. Kirsch also encouraged me to cut my portions down. For example, I’m crazy about sweet potatoes, which are a staple in any healthy diet and high in vitamin A, vitamin C, and fiber. But they’re sugary, coming in at approximately 24-27 grams of carbs per potato. Kirsch encouraged me to bake one sweet potato at the beginning of the week and eat it in fourths. Gone were the days of downing one whole potato in a single sitting like a normal person. On the new plan, lunch consisted of throwing homemade grilled chicken, one fourth of a sweet potato, and tons of veggies together in a salad. 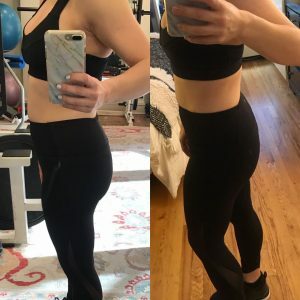 Diets are not one-size-fits-all, but for me, this plan worked to flatten my stomach (see the before and after photos above). While I did not weigh myself, since my goal was to debloat rather than shed pounds, my jeans fit dramatically better and my waist felt more contoured. 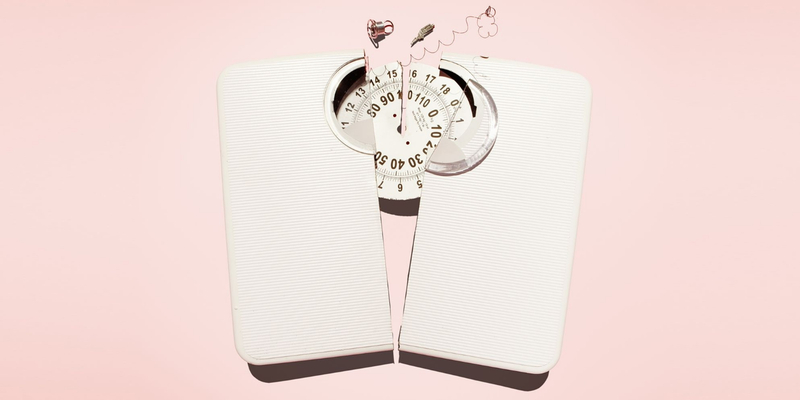 “What I’ve noticed with weight loss is the more you move your bigger meals to earlier in the day, the more successful people tend to be,” Dr. Berkowitz says. And for me, that theory proved to be true. I also was less anxious about eating in general. Knowing I could have a slice of whole wheat margherita pizza for lunch (and I certainly did during the 12 days) kept me from feeling deprived. Nothing was off limits, so I was less likely to get cravings and then overeat. When it came to continuing the plan, I adopted the 80/20 rule. That leaves the chance for me to go to Gramercy Tavern with my husband for a Saturday night dinner and go to town on the cheese-infused homemade bread. What I’ve noticed with weight loss is the more you move your bigger meals to earlier in the day, the more successful people tend to be. BAZAAR speaks to Charlize Theron in an exclusive interview on the spirit of the new J’adore woman. From red lips to graphic eyes, here are the key make-up looks to get on your radar. The actress stars in Louis Vuitton’s first fragrance film campaign.